I know that you cannot live your life eating only ultra low-calorie protein. I have tried that and merely rebounded after starting to eat “normally” again. And, if you are not a vegetarian or vegan, chances are that you will want to eat evil red meat from time to time. The solution to this problem is portion control. Last night we had ribeye steak. I kept my portion small and filled my plate with vegetables and half a baked potato. See, not so bad! John grilled the steak (a little too rare for me) and also the baked potato which I had microwaved before it hit the grill. Speaking of the baked potato, you do not need a whole potato. Plus you don’t need to drown it in butter or sour cream or bacon. I had mine with tomatoes and sometimes I have it with ketchup so I can pretend that it is French fries. The rest of the dinner was broccoli that I steamed and added a pat of butter to. Be sure to eat the stems and well as the florets! 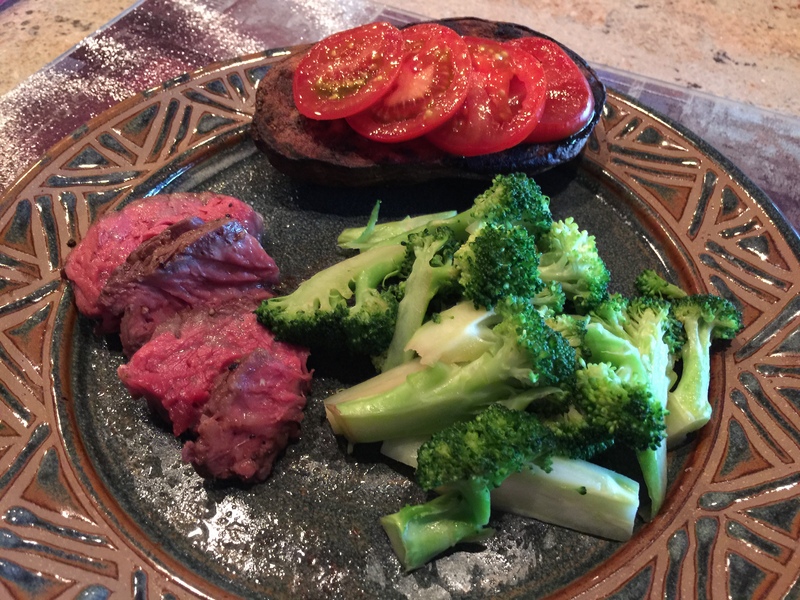 This entry was posted in Beef, Healthy tips, Vegetables and tagged broccoli, diet, grilled potato, rib eye steak, Vegetables. Bookmark the permalink.